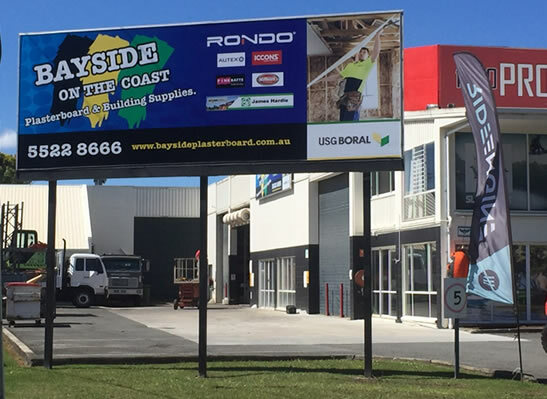 Bayside Plasterboard have expanded their business and have now opened their doors on the Gold Coast! Established in Capalaba in 2001, Bayside Plasterboard have recently expanded, opening a second store on the Gold Coast in November 2016, to complement their established, successful Bayside business. You can now find Bayside Plasterboard in both Capalaba and at the newly opened Gold Coast store. Bayside Plasterboard supply and deliver their extensive range of brands and product ranges to all of South East Queensland, and have physical locations in both Capalaba and the Gold Coast. In 2001, owners Darren and Kim Rubach opened their Bayside Plasterboard business with a modest three staff, one truck, and a 400m2 shed! Following a successful few years of business and increased demand, the Bayside Plasterboard store relocated to a new 3500 m2 complex in Capalaba in September 2004. A vision to continue to grow the business even further was realised in November 2016, with the already successful Bayside Plasterboard business opening its doors in Carrara on the Gold Coast. Bayside Plasterboard now operates a fleet of seven vehicles, and comprises of a team of twenty dedicated and experienced professionals, committed to go “the extra mile” for their customers. With the established Capalaba store serving the growing needs of the building industry throughout the Brisbane area, the newly opened Carrara store is now meeting the needs of customers and the building industry in the Gold Coast region. Bayside Plasterboard continue to service all of South East Queensland. The team at Bayside Plasterboard pride themselves in offering “good old fashioned service,” working with their customers to provide products and services to the highest standard. Bayside Plasterboard own their fleet of trucks, guaranteeing customers a prompt and safe delivery service on-site, where and when it’s needed. In doing so, Bayside Plasterboard are able to offer superior service to its vast range of customers, including professional plasterers, builders, and DIY customers, including delicate or tricky deliveries. As well as physical stores in Carrara on the Gold Coast, and Capalaba, Bayside Plasterboard offer a prompt delivery service throughout South East Queensland, as well as areas including North Stradbroke, Macleay, Russell, Coochiemudlo, and Lamb Island. The impressive showrooms at Bayside Plasterboard stores offer a wide range of plastering tools and accessories, hand tools, and power tools, to cater to the professional tradesman through to the DIY customer. Bayside Plasterboard has grown to become one of the largest independent suppliers of a range of quality products and brands including James Hardie, Rondo, Makita, Boral, Bostik, and many more. The professional, dedicated team at Bayside Plasterboard look forward to helping you meet all your plastering, insulation, framing, fibre cement, internal fitout, and related needs.